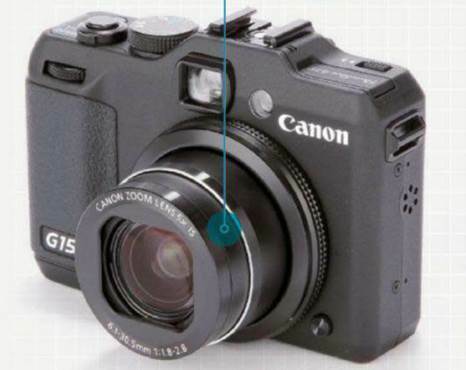 With the PowerShot G1 X already here, how does the G15 defend its existence? Canon’s PowerShot G-series used to be one of the most respectable compact cameras for photographers, but the past few years have seen many of its opponents that have similar specifications and a gradually increasing number of mirrorless system cameras that reverse its position in the DSLR-alternative market. However, this series continues with the G15, which has plenty of modifications from the previous G12 model. The 1/1.7-inch sensor has a backlit architecture for better light-gathering capabilities, with an effective resolution of 12.1MP and a sensitivity range of ISO 80-12,800 at full resolution (2 stops greater than the G12). Full HD video is recorded at 24fps, with a 720p option recording at 30fps, while the standard 2.1fps burst mode is joined by a high-speed alternative which rises to 10fps at maximum resolution. While the 28-140mm lens holds the same focal length as the previous G12, the f/1.8-2.8 aperture makes it significantly brighter. Once again, we see that it is accompanied with Image Stabilizer to provide 4 EV stops of adjustment, as well as a built-in neutral density filter to increase exposure times. Around the back, there is a 3-inch LCD with a 922k-dot, on the top is an optical viewfinder – a feature much looked for by the camera’s target market. Raw shooting is also provided, as well as full manual control over exposure and even an electronic levelling function. While the G15 is a G-series in terms of appearance, revolutionary changes and those made as a result of redefined functionality mean that its results are quite different from the G12’s ones previously. For instance, the handgrip is narrower, while the command dial on the front plate now looks forward at a slightly upward angle as before. The latter change seems to be minor but it makes the dial more difficult to control, basing on the fact that the user’s forefinger doesn’t naturally lie on the front plate when the camera is held normally. Like on the G12, part of the exposure compensation dial is covered by the mode dial above it, in order to have an appropriate size and to be accessible. Both the dials turn freely and are easy to adjust, although provided that they protrude from the top plate, this characteristic isn’t always desired, as one of the two is easily removed from its position. Despite the camera’s light weight and small size, it feels powerful and is built with a good standard. Around the back, the change from an articulated LCD screen to a fixed one has brought some benefits with it of a bigger display (3 inches from 2.8 inches), and the body is thinner (by about 20%) over the G12. However, the rising appearance of the screen, together with its close position to the menu pad dial, means that turning the latter cay cause you to touch the former. It takes just about a second for the camera to get ready from being switched on, though it’s not impressive, it’s not bad either. Write speeds are impressive, though, and the camera’s focusing system is, too, in good light, and, thanks to the powerful assist light, it’s still considerably good in poorer light. The viewfinder’s view is partially covered by the outer body of the lens at wider focal length (popular on cameras which have optical viewfinders), though this disappears by around 50mm. In addition, what’s concerning is that the parallax error caused by the difference in position between the viewfinder and lens is not indicated by any markings, which makes it useless to frame accurately. Of course, this is not an issue with the LCD; the resolution and its viewing angle are very impressive, and any issues related with the visibility only occur when shooting under strong light, which can be well understood. In balanced conditions, there are few faults with the camera’s metering system, though areas of highlights are often omitted to put the subject in priority. This is suitably appropriate for consistently underexposed subjects, but combined with a tendency of overexposure, which means sometimes exposure compensation is necessary. JPEG images display a reasonable amount of detail, and even when the camera tries to reduce noise at higher sensitivities, detail still appears. However, image processing leaves specific details unnaturally defined, especially natural subjects like human faces. Nonetheless, in good light and at low sensitivities, images are only affected by a slight texture and an occasional chromatic aberration. The Auto White Balance system is generally impressive, with good predictions made in mixed natural/artificial scenes, and colors are vitally natural and accurate (therefore, sometimes one of the vibrant My Colors settings proves to be more appropriate with print-ready results). Videos display plenty of detail (helped by the effective IS system) and amazingly good sound, together with steady exposure changes. The camera does a great job to maintain resolution in Raw images within the sensitivity range, with consistent results from ISO 80 to 200, and still significant results to ISO 6400. At higher sensitivities, the camera’s processing still does well in reducing chroma noise from JPEGs while preserving details. The camera does a great job to maintain resolution in Raw images within the sensitivity range. 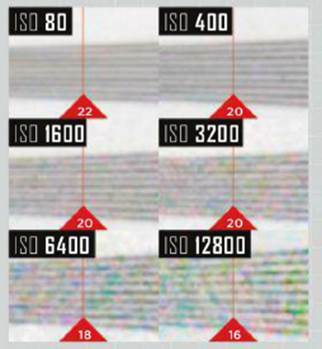 Canon has made some pleasing changes here in comparison with the G12. With a fast AF system and quick Raw write times, the camera is suitable for street photography, but while image quality is good, it’s just not as good as we expected. At last, while the camera itself is quite capable, the competition from the cheaper Nikon P7700 và Panasonic LX7 means that at the present, it’s just not the best option in the whole group.